Please note the following policies and procedures regarding Midterm Examinations. 1. The Midterm Examination Cycle begins January 16th with the administration of in-class local examinations (i.e. psychology, management/business, NJROTC, etc.) These examinations will take place during their regularly scheduled class. 2. Traditional Midterm Examinations (local and Regents) will begin January 22nd and continue through January 26th. An examination schedule has been attached for your review. 4. Students are to be in FULL COMPLIANCE WITH SCHOOL DRESS CODE. Students not in dress code will be sent home or directed to contact a parent for delivery of missing items BEFORE THEY WILL BE ADMITTED TO TESTING AREA. 3. 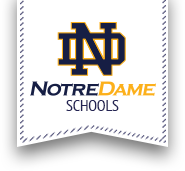 Transportation: buses will depart Notre Dame Jr/Sr HS at 11:30 a.m. on Monday-Tuesday-Wednesday. BUSING IS NOT PROVIDED ON THURSDAY AND FRIDAY! Busing to and from BOCES will continue as normal. 4. Students are to have all required materials and equipment for the taking of their examination (calculators, compasses, protractors, pencils, pens (blue/black), rulers, and any additional items specified by their assigned teachers). Please check batteries for calculators! 5. STUDENTS WHO ARE ABSENT FOR A MIDTERM EXAMINATION MUST HAVE A SIGNED DOCTORS NOTE IN ORDER TO MAKE UP THE EXAMINATION! 6. Students completing a semester course MUST turn in their ASSIGNED textbook in order to gain admission to the examination. We strongly recommend that students touch base with their teacher or Mr. Jaynes to verify that they have the textbook that they were issued. Students/Parents will be billed for all missing and/or damaged textbooks. 8. We ask that transportation arrangements be in place to facilitate the needs of each student for the purposes of departing the building. Supervision after 12:00 p.m. will NOT be provided unless taking an examination. 9. Lunch is NOT served during Midterm Examination week (January 22nd through the 26th). 10. Unauthorized absence by a student will result in a grade of 0 for examinations missed. 11. In the event of a school delay or closing, a message will be sent providing alternate testing policy and procedures.